The focus is inventory in both reports. In the Quarterly grains stocks report, inventory reported refers to physical actual inventory in the U.S.In the WASDE, the inventory figures that is key is a monthly estimate, which is ultimately used at the figure for year-end inventory at the end of the fiscal crop year. 1/10/14: USDA releases WASDE report; corn prices spike. 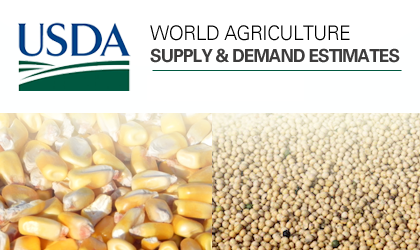 USDA lowers 2013/14 ending stock estimates for corn to 1.631 bln (COMDX) : Click here for WASDE report. and livestock (SAFM, HRL, SFD, TSN). Related ETFs: JJG (grains ETF), CORN (corn ETF) and WEAT (wheat ETF).